My post yesterday had put lots of knots in many Opposition supporters’ (Penyokong Pembangkang or PEPEK for short) knickers, it seems. Some questioned why is it that they cannot find reference to some of the things I had written. The answer is simple – I attended the talk by US Supreme Court Advocate Appellate Tom Goldstein. So did some others whom I saw, like Azmi Arshad, blog owner of Another Brick In The Wall, Tun Faisal of JASA, members of the media (both mainstream and electronic). The talk was supposed to start at 9am and was to finish at 11am as the auditorium was to be used by another session. Tom arrived late, around 10.25am and was given only half an hour to speak with five minutes of Q&A session. Among the questions asked during the very short Q&A session were “Does the US plan to do away with the jury system in its trials” and “The 1MDB is a civil forfeiture suit, why is there now a criminal action being pursued”. Both were answered by Tom as per the media reports. And then it was announced that they had to cut the session short because the auditorium had been booked for another programme. Tom was ushered into a meeting room where he and the Dean of the Faculty of Law had their coffee break, together with some UiTM staff. The media chaps were ushered to a different place to have their food. Only Tun Faisal, a journalist from The Mole, and I, managed to bring our food and sat at the same table with Tom. Tun Faisal and I asked the questions on IPIC, SRC and 1MDB where Tom mentioned the complexity of the case and why there is absolutely no progress whatsoever – the complainants who are in no way linked to 1MDB lodged a complaint with the US Department of Justice saying that money had been siphoned from the 1MDB, to which the 1MDB had denied losing any money. So to whom should the money be returned to if no one has lost any? And to this I asked Tom if this is the reason it has taken the DoJ so long to actually initiate something, he answered with a simple, “Yes.” In other words, the probe has come to a standstill. The only reason they have asked a stay on the civil investigation and changed it to a criminal one is to NOT allow any of the money to be spent. To date, no one has been named as criminal defendants, not one charge has been filed, and not one targetted to be investigated on a criminal charge. 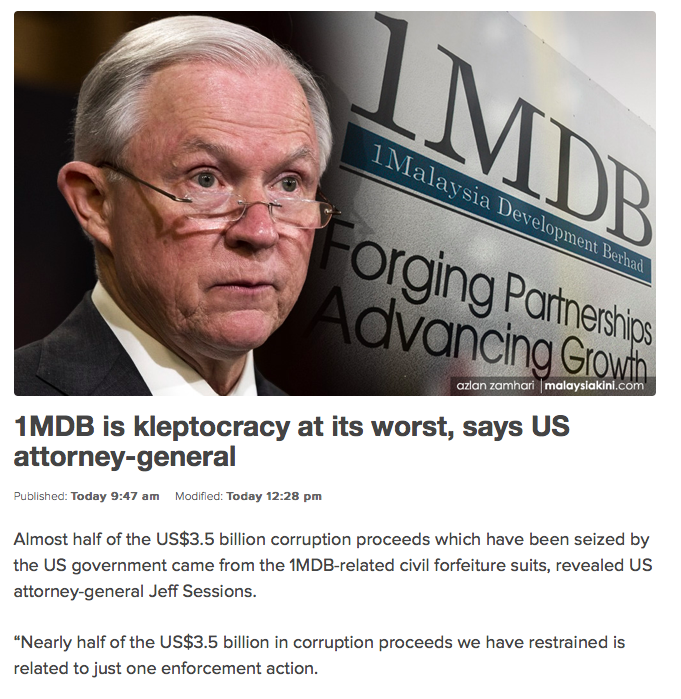 Which brings me to this: the Attorney-General of the US, in his speech at the Global Forum on Asset Recovery in Washington DC yesterday said that 1MDB is kleptocracy at its worst. Mr Sessions said that allegedly corrupt officials and their associates had reportedly used the 1MDB funds for a “lavish spending spree” such as US$200 million for real estate in South California and New York, US$130 million in artwork, US$100 million in an American music label and a US$265 million yacht. 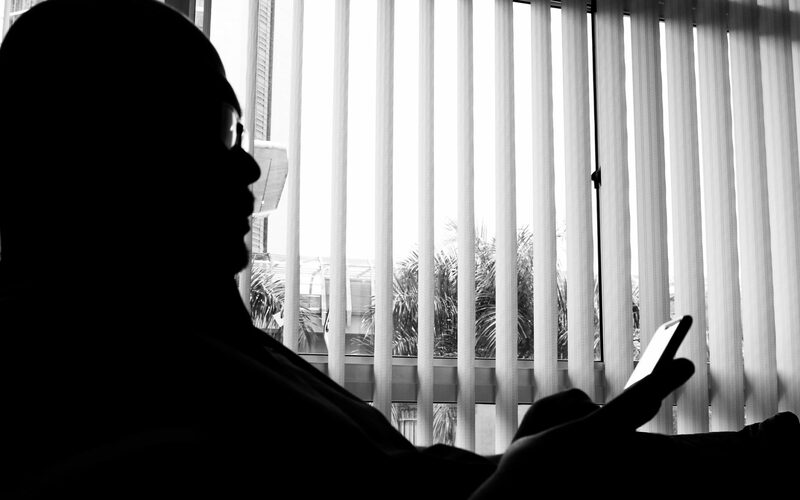 1MDB officials allegedly laundered more than US$4.5 billion in total, he said, through a complex web of opaque transactions and shell companies with bank accounts in various countries such as Switzerland, Singapore, Luxembourg and the US. This is nothing new. This is something we have heard which was read live on cable TV by Mr Sessions’s predecesor. And this brings me to a question – if this is so, why hasn’t the US DoJ taken any action for the past year and a half? This only underscores what Tom Goldstein had said – the complaint said the money was siphoned from 1MDB, but the 1MDB said they have not lost a single cent. So, whose money did these “1MDB officials” siphon? Those assets have been frozen since mid-2016 and still have not been returned to 1MDB. Why is that? All the people that have been charged, tried and sent to jail for laundering “1MDB money” in Singapore and elsewhere in the world were bank employees who flouted the local financial regulations. Yet, not a single 1MDB employee has ever been charged in those courts. Why? PEPEKs are dancing today thinking that something new had been revealed, when it is just old news being repeated. No doubt that they money and assets the US DoJ confiscated last year represents kleptocracy at its worst. But what has that to do with 1MDB? Can we have the money back now if they are 1MDB’s? The PEPEKs think that they have won the argument, but really they are just dry PEPEKs, giving an erectile dysfunction to the celebration.